When spring takes wing at Pennswood, it’s an ideal time to discover the Bluebird Trail and the Bird Sanctuary located in the stunning natural environment which is Pennswood’s Meadow. “A great way to start is to contact the Pennswood Birders,” says Ann Baker, a five-year Pennswood resident. 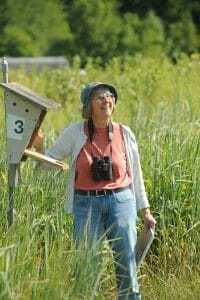 Ann is the facilitator of the Pennswood Birders, one of the many committees and clubs that make Pennswood Village so diversely engaging for residents with interests of all kinds.